The second of four children, Marcel Demagny was born in October, 1949. He graduated from the Nancy, France, School of Architecture in 1974, formerly known as the National School of Fine Arts. After receiving his diploma, Demagny became the chief architect of the French City, Nancy, in which he still resides today. It was during his years in school that he explored an interest n painting. He worked with graphic designers, painters, and the plastic arts. Color and matter have always played a major role in Demagny’s style. 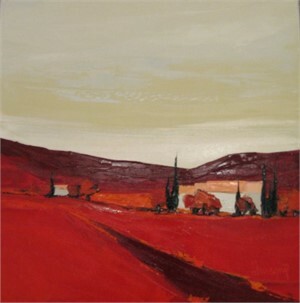 Many artists have influenced the manner in which he paints today, such as very talented angles and the absence of hue. 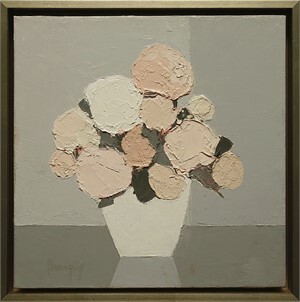 Demagny’s work is obviously inspired with his sharp cut edges of petals and their monochromatic background. Another artist that greatly influenced Demagny was Bernard Buffet, a graphic designer. While he used a different medium, his work represented the idea “less is more”. Buffet put his feelings into an ordinary object. Demagny wants this in his paintings. He lets his emotions guide him along the canvas. Presently he devotes more time to painting as architecture can not express his creativity any longer. His favorite subjects include landscapes, floral arrangements, music and automobile racing. He loves these subjects but chooses to not confine himself to one in particular. 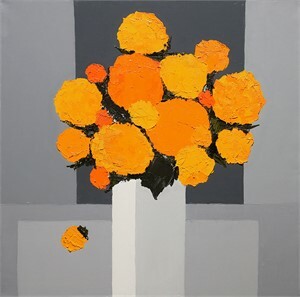 The color and style of Demagny’s paintings are truly an expression of himself. The second of four children, Marcel Demagny was born in October, 1949. He graduated from the Nancy, France, School of Architecture in 1974, formerly known as the National School of Fine Arts. After receiving his diploma, Demagny became the chief architect of the French City, Nancy, in which he still resides today. “I have always been fond of musical analogies and would say that as an architect I am a conductor, and as a painter, I am a soloist. I have reached my current style, which is now well established, working by layering colors with the palette knife and spatula. This is the culmination of 37 years of passion and practice.” – Demagny It was during his years in school that he explored an interest n painting. He worked with graphic designers, painters, and the plastic arts. Color and matter have always played a major role in Demagny’s style. Many artists have influenced the manner in which he paints today, such as very talented angles and the absence of hue. 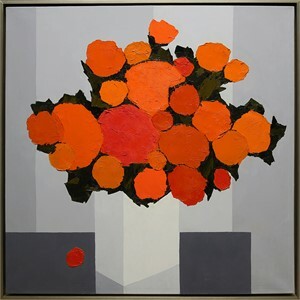 Demagny’s work is obviously inspired with his sharp cut edges of petals and their monochromatic background. Another artist that greatly influenced Demagny was Bernard Buffet, a graphic designer. While he used a different medium, his work represented the idea “less is more”. Buffet put his feelings into an ordinary object. Demagny wants this in his paintings. He lets his emotions guide him along the canvas. Presently he devotes more time to painting as architecture can not express his creativity any longer. His favorite subjects include landscapes, floral arrangements, music and automobile racing. He loves these subjects but chooses to not confine himself to one in particular. The color and style of Demagny’s paintings are truly an expression of himself.